Book a train from London to Bath. Trains to Bath run from the London Paddington or London Waterloo rail stations every half an hour. Buy cheap train tickets from London to Bath online here and save on your rail journey to this beautiful city! With over 3.8 million visitors to the City of Bath every year, you can see why it is important to plan your journey carefully to this World Heritage city. For over 2000 years, visitors from across the world come to Bath for business and leisure. Only a few places compare to Bath. Whatever brings you to Bath, do not miss visiting the waters of the Thermae Bath Spa and the early industrial relics of the Somerset Coal Canal in the Combe Hay Village! Trains from London to Bath leave London from two train stations. These are the London Paddington and London Waterloo stations. While train journey from London Paddington station tends to be quicker and more expensive, travelling from the London Waterloo station maybe cheaper but up to an our longer. You can get a train from any of these stations to the Bath Spa train station over the river Avon in the famous UK city of Bath...known for its hot water spring or the "Roman Bath". The Bath Spa station is the major railway station in the City of Bath. All trains from London and many parts of the UK stop here. The journey from London to Bath by train takes from 1 hour 35 minutes up to 2 hours 30 minutes, depending on the station you choose to travel from, train speed and connections stopped at. Journeys from the London Paddington station tends to be quicker. You can book your journey by train from London to Bath, using the search box above. Enter PAD (London Paddington) as departure station and BTH (Bath Spa) as your destination. You can get cheap train ticket from London to Bath here. If you are new to London and not sure how to get to the London Paddington station, here is a guide. London Paddington station is on the Bakerloo, Circle, District, Hammersmith and City lines via the London Underground. From London Liverpool street, take a West bound train on the London Underground and this takes you to the 9th stop, which is the London Paddington station. You can buy a ticket to cover the whole leg of your journey from here, whether you are leaving from London Liverpool Station or indeed any station in the UK to Bath. 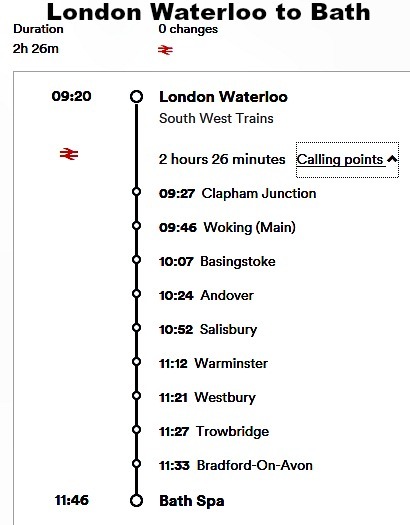 Just enter the details in the search box above and get train times and tickets. 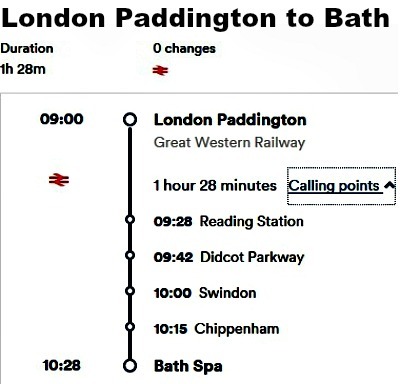 Train stops from London Paddington station to Bath Spa station. As you would expect, the cost of train fare from London to Bath goes up every year. Nevertheless, the average cost of making a single journey on this route has remained around £18.00 for advance singles up to £125.00 for anytime single. A return train ticket from London to Bath currently cost from £59.00 for 'Super Off-Peak Return. This allows you to make a open return journey back to London during off-peak times up to one month from the day of your departure. On the other end of the spectrum of open returns is the 'Anytime Return' which currently cost about £159.00. This ticket allows you make a return journey any time up to one month from the day of your outward journey. Do you have a railcard? You can apply discounts on your railcard and save a further 3rd on your travel cost. If you are going to travel a number of times on the UKrailways in a year, buying a railcard could save you a lot of money on your travel cost. Booking a train from London to Bath is worth it even if only to see this ancient bath pool! Whatever is taking you from London to Bath, save money buy looking out for opportunities to get cheap train ticket to Bath. Apply these suggestions and secure yourself a bargain. Once you are definite on going to Bath, and you know the date, go online and buy your ticket. You could save up to 80% on the cost of train travel. Make your bookings as early as 3 months from the day of travel, or book an advance ticket up to 18:00 hours the day before travel. Book your train ticket from London to Bath to commence your outward journey after 09:30 Hours and inward journey after 18:30 Hours. Why not try splitting the journey into at least two legs. You can try buying a ticket from London to Oxford, and then from Oxford to London online while buying tickets and see how it comes on. Sometimes, buying two single tickets comes out cheaper than buying one return. This is definitely true in case of Bath. A single off-peak ticket to Bath cost about £18.00 each way, compared to a return off-peak ticket which costs £59.00. That is a whopping £23.00 or 62% savings just by buying two single tickets instead of a return ticket! Remember to check train times and fares and buy a cheap ticket for a train from London to Bath online. If splashing out for a journey on train from London to Bath is a bit too much for your pocket, why not try another means of traveling to Bath? You can also make this journey from London to Bath on a coach and save even more especially if you do not mind spending about 4 hours on the journey. All you need to do is take a coach from London Victoria coach station to Bath. See what this might cost you on the National Express Coach to Bath. 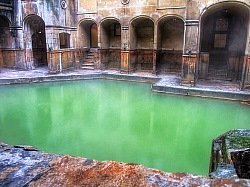 Are you on holiday to Bath to see the Roman Bath Spa of hot spring water from Cotswold Hills or for business? Whatever takes you to Bath, enjoy your stay. Make sure you also get a bargain ticket for your train from London to Bath.